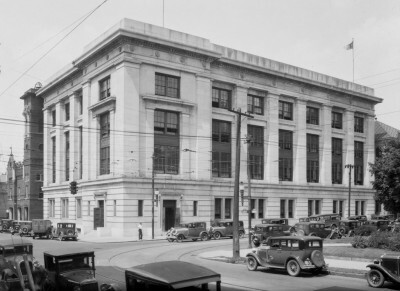 North Carolina's Department of Revenue was created by the General Assembly in 1921, making it one of the first in the United States. That year, the legislature approved a comprehensive net income tax in response to growing dissatisfaction with the state’s tax structure and independent recommendations from two study groups. The Department of Revenue was created to administer, enforce and collect the newly-created income tax. In May of 1921, the Department had 16 employees. By the end of the fiscal year, that number had grown to 30 and the Department had collected just over $3 million in income and inheritance taxes. In the following decade, the Department grew as it was assigned the tax collection duties formerly held by other state government agencies, such as assessment and collection of the franchise tax -- jobs formerly performed by the State Auditor and Treasurer -- in 1923. The Department also took on the duties of collecting license taxes and collecting taxes on insurance companies. The General Assembly also moved the Motor Vehicle Bureau -- which administered automobile license taxes, the gasoline tax and the bus and truck franchise tax -- to the Department. Throughout the 1930's, the Department's responsibilities and its staff continued to grow. A new unit was created to administer the sales tax, which went into effect in 1933, around the same time the Department became responsible for the new beverage tax. The state's Highway Patrol also became part of the Revenue Department's Motor Vehicle Bureau. However by 1941, faced with growing needs on the state's highways and the Patrol's increasing responsibilities, the state's Department of Motor Vehicles was created at the Governor's urging. The entire Motor Vehicles Bureau became part of the new department, leaving only the gasoline tax unit at the Department of Revenue. During its early years, the Department moved from its original home in the Capitol's Senate Chamber, clerk's office and committee rooms to temporary quarters at the Agriculture Building. Later as the Department grew, the state bought the Brown-Rogers Building to house several of the Department's divisions. To solve Revenue's growing space needs, the General Assembly approved construction of a new building in 1986. The Department of Revenue moved to its new home on Wilmington Street in December 1992. As part of its continuing commitment to serving North Carolina taxpayers, the Department has worked to keep pace with technological innovations and improve efficiency. The Department began using automated equipment to process individual income tax returns in 1960 and added an optical character reader capable of scanning hand coded adjustments on tax forms in 1977. As computer use grew, the Department planned an integrated tax accounting system that would bring information from separate divisions and tax schedules together into one database -- making it faster and easier to cross check files and tax returns and provide taxpayers the information they need. The system was fully in place by 1997. The Department also encouraged taxpayers to file their income tax returns electronically. In 1997, North Carolina led the nation in the number of electronic returns with more than 540,000 filed. During the 1970's the General Assembly made several changes that reorganized state government, including the Department of Revenue. The Commissioner's title became Secretary of Revenue. The Secretary is appointed by the Governor and serves as an ex officio member of the Tax Review Board. The Secretary also serves as a member of the Local Government Commission. Today, the Department of Revenue is led by the Secretary, Chief Operating Officer and three Assistant Secretaries. As North Carolina grows and the needs of its citizens change, the Department of Revenue will continue its efforts to provide taxpayers with the most efficient and effective services possible.